The report, released Tuesday by the U.S. Government Accountability Office, says that federal agencies did not find out about "zero tolerance" at the border until it was publicly announced. Federal agencies did not plan for the potential increase of children who were separated from their parents during “zero tolerance,” according to a report by the U.S. Government Accountability Office. Migrant shelters run by the U.S. Department of Health and Human Services were often left scrambling to accommodate an influx of children, as the health agency and the U.S. Department of Homeland Security faced difficulties in reuniting these children with their parents. As of Oct. 15, nearly 250 separated children had not yet been reunified. Officials at three federal agencies under Homeland Security and Health and Human Services — who arrest the migrants that cross the border illegally, deport them, transfer children to shelters and oversee those shelters — said they did not find out about "zero tolerance" until it was announced by President Donald Trump on April 6, according to the report. “They were unaware of the memo in advance of its public release,” the report said. 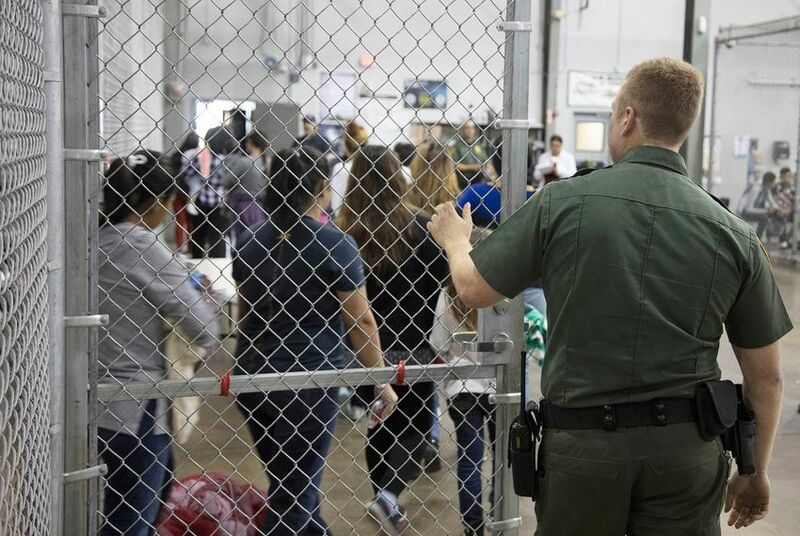 The report was written based on interviews with officials from five offices across the Homeland Security and Health and Human Services departments, as well as visits in late July and early August to government shelters housing migrant children in Arizona and Texas. Initially, agencies made no distinctions between separated kids and the children who regularly arrive at the border unaccompanied. It wasn’t until April 19 that the Border Patrol agents who arrest migrants were told to denote whether a child was an unaccompanied minor or had been separated from their parents. But that didn’t mean that they consistently did so, the report said, or that the officials tasked with finding a shelter for those children always found out a child had been separated. Officials at the Office of Refugee Resettlement did not develop a system to note which children were separated until July 6, after Trump ended "zero tolerance" with an executive order. At shelters, this meant inconsistent information for caseworkers. At one shelter, the report said, staff said they only learned some children had been separated from the children themselves — if those children, sometimes as young as infants, could even explain it. Because most migrant shelters contracted by the Office of Refugee Resettlement are not equipped to receive young children under age 5, those faced with an influx of these “tender-age” migrants were forced to adapt, the report said. One shelter added cribs, toys and small tables to convert a classroom on its premises into a space for young children. It noted that no “specific procedures” existed to reunify separated families until a federal judge ordered on June 26 that children be reunited with their parents. In the process of reunification, staff at shelters said it was sometimes difficult to contact the detention centers where parents were being held by Immigration and Customs Enforcement. Some shelters did not get a list of detention center contacts that were supposed to have been distributed by ICE, the report said, and officials in detention centers would cut short calls between children in shelters and their detained parents. “According to ICE officials, they were concerned that [shelter] staff were consuming too much of the 10 minutes allotted for parents and children to speak and were also going over the allotted time,” the report said. With one government agency transporting parents to be reunified and another transporting children, shelter workers and the agency contracting them said they had to wait for unreasonably long amounts of time. “In one case, staff at one shelter told us that they had to stay two nights in a hotel with the child before reunification could occur,” the report said. An entirely separate process had to be set up for situations in which the parent was no longer being detained by the government — namely, if that parent had already been deported. And if a migrant shelter had already released the child to a sponsor — a relative or friend already in the United States responsible for receiving the child in the case of unaccompanied minors — the government was not responsible for reuniting them. Officials said they did not know how many children fell into this category. Once it “releases a minor to a sponsor, HHS’s custodial relationship to that minor ends,” health department officials said, according to the report. “It is also important to highlight that during recent months we have identified further areas for interagency process improvement and coordination,” Crumpacker’s letter said.